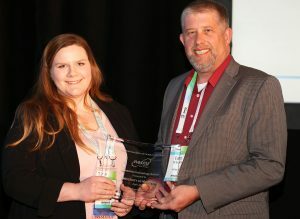 The winners of 2018 NACCU Annual awards were announced on April 25, 2018 at the Association’s 25th Annual Conference in Reno, Nevada. Headlining the award winners was the Distinguished Service Award, which was given to Georgia Tech’s James Pete in recognition for his many years of dedicated service to NACCU, as well as his participation in Association events. Additionally, NACCU recognizes the following individuals and institutions for their accomplishments. Erin Chezick is the recipient of the 2018 NACCU New Professional Award. The award was presented by Leti Turnbull-Mason from award sponsor Wells Fargo. Established in 2012, the New Professional Award is designed to recognize contributions to the industry and the association by individuals early in their careers. 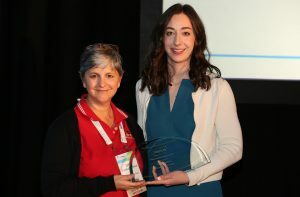 The Award is presented to an individual who has contributed to the industry through a combination of Conference events, New Professional Institutes, an other service contributions to the Association. Having only been involved in the campus card industry since 2014, Erin has contributed to her university and to NACCU as a volunteer. She has also made a significant impact since joining Carleton University’s campus card services. At Carleton, Erin developed and implemented a comprehensive student staffing process that has proven beneficial for all that have adopted it. The process includes interactive training components, feedback, and enhanced communication. She also led the implementation of the Universal Transit Pass’s smart card program at Carleton, while continuing to pursue solutions that will integrate the student ID and bus pass to one card. Erin also took on the task of performing a review of her department, which had not been done since 2004. As a result, Erin was able to introduce a strategy for tracking and prioritizing projects. Beyond her work at the university, Erin has been very active within NACCU. In addition to attending numerous conferences, she has participated as a presenter, a committee member, and a committee chair. She has also served as a member of the mentor program and as faculty for the New Professionals Institute (NPI). USCard Services at the University of Southern California received the 2018 Best Marketing Campaign Award. NACCU Board President Ken Boyer presented the award to Loryetta Council and William Bourlier during the 25th Annual Conference in Reno on April 25, 2018. The NACCU Best Marketing Campaign Award is presented to an institution to recognize implementation of an integrated marketing strategy that has achieved measurable results, to encourage participation in the Association and the industry, and to gather ideas and resources that can be shared by other NACCU Members. USCard Services found themselves dissatisfied with the participation of students submitting images online, as well as with the way ID cards were being distributed during orientations. In search of a solution, they met with the Orientation Program’s senior leadership and expressed their interest in being more active in the orientation programs to benefit both groups, while enhancing the orientation experience for students. USCard began an email and postcard program to reach new students attending one of USC’s 19 new student orientation programs. ID cards were distributed with an information-filled postcard at the Student Services Expo, where incoming students were celebrated with Instagram posts. From those posts, one lucky freshman was given a USC backpack during each of the freshman orientation’s Instagram raffle. The results were significant. Online photo submission and ID card distribution for each orientation event increased from 83% of all participants during the Summer 2016 cycle to 94% for Summer 2017. Additionally, credit card deposits increased by 8% and cash deposits increased by 40%. View USC’s award submission to learn more about what USCard Services accomplished through this initiative. 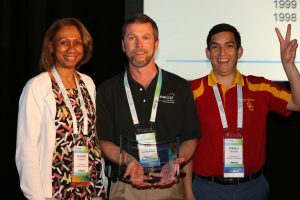 The University of Montana received the 2018 NACCU Innovative Technology Award. 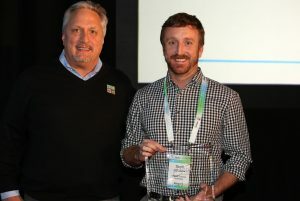 Brett St. Pierre from award sponsor HID Global/ASSA ABLOY presented the award to Montana’s Maggie McCarthy. Established in 2012, the NACCU Innovative Technology Award is presented to an institution that has introduced a unique technology-based solution to a problem or opportunity. The award’s purpose is to encourage members to share unique and innovative ideas with other members, as well as to recognize those who make significant technological contributions to the industry. The University of Montana’s Griz Card Center first launched UMoney, a flexible spending account, in the early ‘90s. From the beginning, a tedious process was used to review and process inactive flexible spending account balances. During an audit in January 2016, it became obvious that it was time to automate the processes and terms and conditions. The University of Montana wanted an automated process to notify customers after nine months of inactivity, giving them three months to take action, after which the account would be zeroed. The university also wanted an automated process to report fees assessed for account closure, and any refund amounts. Finally, funds would be automatically refunded to the customer. This entire process had to include a clear audit trail, and integration with multiple softwares, including Blackboard Transact and Banner, was a necessity. Due to the complexity of requirements, it was determined that UM’s Student Affairs IT Web Team would build a custom web-based application. Prior to implementation of the app, there were 8,079 UMoney accounts that should have been zeroed out following the former manual process, along with more than $10,000 in UMoney accounts still being held in trust. An overwhelming 89% of the accounts held a balance of under $10, which would have been zeroed out when the administrative fee was assessed. The solution to Montana’s problem came in the form of the Unclaimed Property Web Application, which combines a number of previously manual processes into one comprehensive automated process. Customer service has been improved, and the time spent on inactive accounts has been reduced to under two hours per month. Additionally, the university is now fully compliant with state law regarding unclaimed property. Since the implementation of the Unclaimed Property Web Application, $17,822 has been refunded through UM’s Business Services process, and $16,265 in administrative fees have been assessed. To learn more, view Montana’s award submission. Liberty University received the 2018 NACCU Best Video Award for its Flames Pass promotional video. 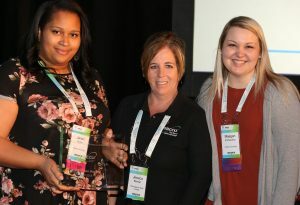 Janeil Pyton and Maegan Immordino accepted the award from NACCU Immediate Past President Jessica Bender. Liberty’s video was created to inform students, faculty and staff about the Flames Pass — the official Liberty University ID — and its many uses, as well as shed light on the benefits of using the university’s declining balance account, Flames Cash. The idea for the video was to capture the attention of multiple generations, from incoming freshmen to Liberty’s extensive online population. The video provides fun and entertaining way to engage with the student population, while offering the need-to-know information from ID & Campus Services. The Liberty University Marketing Department was responsible for the creation and execution of the video, while the ID & Campus Services department provided an outline of content and was actively involved in editing the script and providing feedback. Coastal Carolina University’s CINO card received the 2018 NACCU Best Card Design Award . Scott Gallimore accepted the award from Danny Smith and award sponsor, ColorID. The NACCU Best Card Design Award is presented to the institution who is first selected as one of five finalists by the Awards Committee based on a grading matrix, then receives the most votes from NACCU members prior to and during the NACCU Annual Conference. The other finalists up for votes at the Conference were Central Washington University, Dalhousie University, Michigan Technological University and the University of Montana-Western. 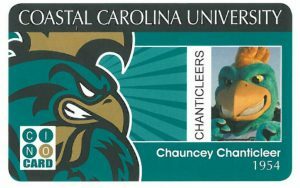 Coastal’s CINO card was initially redesigned four years ago, then updated in Summer 2017 to include an expiration date. The purpose of the initial redesign was to update the card’s graphics to make it coherent with the university’s branding. An expiration date was also added to the CINO Card last year, and the office is in the process of updating cards to reflect that change. Gallimore says there are no other plans to change the design again anytime soon.